This week, a weirdly fresh scab was ripped off an old wound by a class project undertaken by one of my colleagues in sociology. In his political sociology course, Eric Bonds charged his students with undertaking “a community involvement project that would help them develop democracy skills and not simply vote in an election and then tune out.” The project that his class undertook was a petition and presentation to the Fredericksburg City Council arguing that they city should rename Jefferson Davis Highway (US Route 1) within the city limits. At the Tuesday evening meeting, the class made its presentation to council. 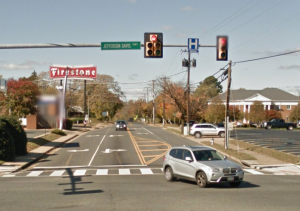 Despite my irrational hope that somehow Fredericksburg wouldn’t be Fredericksburg on Tuesday evening, the proposal was roundly criticized and then summarily ignored. Members of the public who rose to comment were critical of the proposal on the grounds that “chang[ing[ the highway’s name … would ‘erase’ a piece of the city’s history.” Not only would City Council not entertain the petition, a motion to create a task force to study the issue couldn’t even get a second. In other words, Fredericksburg is still Fredericksburg. Removing the Confederate flag and other Confederate symbols from public display is not nothing. Sure, it’s symbolic, but as historians we should recognize how incredibly important and powerful symbols can be … removing Confederate iconography sends an equally important symbolic message: overt defenses of white supremacy are now beyond the bounds of acceptable political sentiment. When it caved to the loudest and angriest voices in the community on Tuesday night, City Council passed up an opportunity to make a very real statement about the acceptability of symbols of white supremacy in our city. 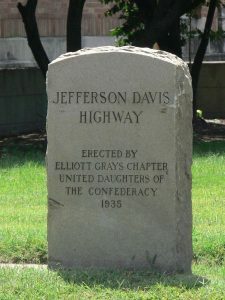 But the point of my post today is to talk about the “piece of the city’s history” that Jefferson Davis’s supporters think renaming the highway would “erase.” From the comments quoted online, most supporters are concerned about erasing Fredericksburg’s Civil War past; as one supporter put it, “at one time [Davis] had an importance influence in what happened in the area.” But of course, neither the highway nor its name are products of the Civil War era. Rather, the name was proposed in the 1910s, the product of twin movements for national highway construction and for the consolidation of white supremacy in the south. The highway was ultimately only assembled in fragments, of which only a few remain … notably in Virginia. Of course, anyone acquainted with American history will recognize this era, between the dawn of the twentieth century and WWI, as the darkest days of overt, politically legitimized white supremacy, especially in the south. Plessy V. Ferguson had declared “separate but equal” to be constitutional, making Jim Crow laws legal and enforceable. Post-reconstruction white political backlash had finally succeeded in suppressing African-American political power in the south. Lynching reached its height in these decades. The original Birth of a Nation (also titled The Clansman) was released a year and a half after the UDC proposed Jefferson Davis Highway. 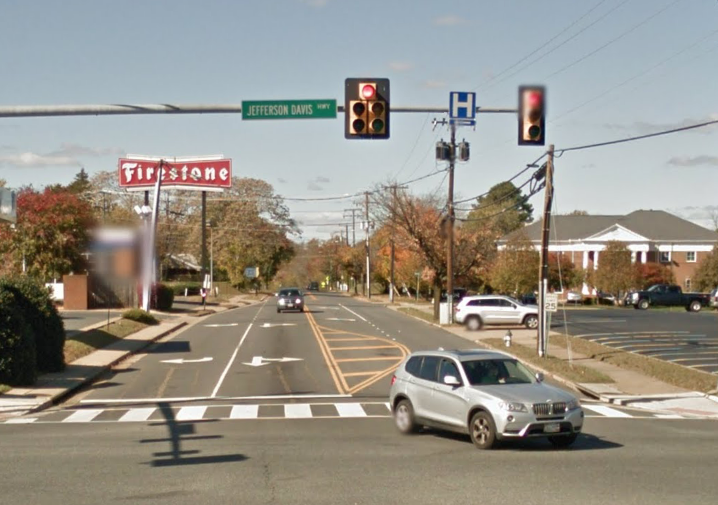 US Route 1 in Fredericksburg got its name at what was one of the worst moments of post-Civil War history for southern African-Americans, and what was also one of the peak moments of neoconfederate romanticization for southern whites. So when we suggest changing the name of Jefferson Davis Highway in Fredericksburg, this is the history we are erasing. We are not forgetting Fredericksburg’s place in the Civil War, nor are we forgetting the momentous effects that that conflict had on our region. No, we are erasing one of the darkest moments in our history, the bloodthirsty and celebratory white supremacy of the early twentieth century. And this is a history that absolutely deserves to be erased from the public highway signs of the city.